All PRP is derived from your own blood. Blood is a very fragile, liquid tissue. It must be handled gently from the time it is drawn, during processing and finally at injection. Careless handling of your blood will result in a major reduction in the quality and healing potential of the final PRP that is for your benefit. Dr. Kassicieh always collects blood and processes the PRP himself for optimal healing outcomes. Unfortunately Fake PRP is all too easy to make and you cannot tell the difference by looking at it. 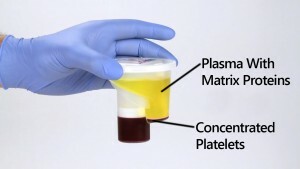 Fake PRP is made by drawing a tube of your blood and then spinning it in a generic centrifuge. The plain plasma and a small amount of whole blood is then put in a syringe and called “PRP.” This Fake PRP has little or no platelets and no tissue healing proteins in it. It has no possibility of healing anything. This is all too commonly advertised at a “low cost” in the range of $300-750. Buyer Beware!!! How long has your doctor been doing PRP therapy? How many PRP treatments does your surgeon/doctor do a year? Does your doctor have video testimonials from patients he has successfully treated with PRP? Does your surgeon recommend PRP first or Surgery for most foot, knee or shoulder problems? Is your surgeon/doctor offering PRP therapy in the office or a surgical center? Has your surgeon/doctor ever received PRP therapy on himself? If no, why not? How many PRP treatments are you told you need? High quality PRP therapy is effective most times with only 1 treatment. Who makes the PRP? Your doctor or someone else? How many times a month do they do this? What is your surgeon/doctor’s healing success with just PRP alone? What PRP equipment does your doctor use? Not all PRP is created equal. What kind of PRP are you getting? Be sure you are not getting fake PRP! Harvest and EmCyte. If your PRP is made from any other machine, you are not getting the best PRP therapy for your money. Matrix PRP – a more concentrated PRP with added growth factors, cytokines and stem cell recruiting messengers – best for most knee and shoulder injuries. Matrix PRP is the most commonly used treatment in our practice as it has the widest application for treatment of joints, tendons and ligaments – with a greater than 90% healing, in the majority of patients. ULTRA-PRP – the best PRP for injuries or situations requiring 2 or more treatments including arthritic (bone-on-bone) knees, back/neck pain from failed spine surgery, herniated discs, hair rejuvenation and non-surgical face lifts.